The Bold and the Beautiful Spoilers: Steffy Chooses Bill After Shooting Drama – Sympathy Sparks Real Relationship? The Bold and the Beautiful (B&B) spoilers tease that Hope (Annika Noelle) will manage to undo some of Steffy’s (Jacqueline MacInnes Wood) progress. After Hope blabs about Bill’s (Don Diamont) proposal, Steffy will lash out at her. She’ll believe this is part of Hope’s plot to get Liam (Scott Clifton) back. Liam will indeed be distant with Steffy after this revelation. Hope will swear that’s not what she intended, but who is she kidding? Why else would she share something she knew would cause conflict? Hope will probably suggest she just had to be honest with Liam. Maybe Steffy will start to think the boy scout and girl scout are perfect for each other! She could easily decide she’s had enough. Meanwhile, Bill (Don Diamont) will accuse Ridge (Thorsten Kaye) of shooting him. Since Bill’s been so angry lately, Steffy might wonder if that’s true. She could side with Bill on this one since Ridge has been out of control. 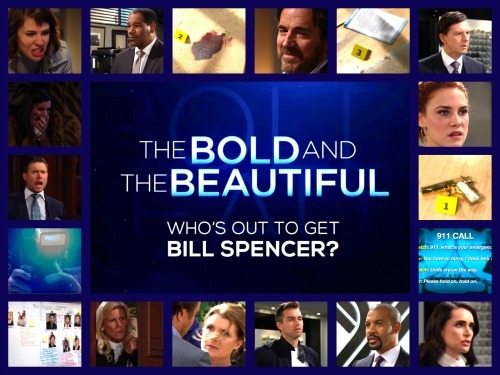 The Bold and the Beautiful spoilers say Ridge will likely be arrested, so the cops will buy Bill’s claims initially. Bill would appreciate having Steffy his corner. No one else seems to be and there’s a good reason for that. It seems like Bill has wronged just about everyone in town. However, Steffy might be able to bond with him again. She may let Bill know that she’s glad he pulled through. Steffy could suggest that it would’ve crushed Liam before admitting she would’ve been heartbroken as well. They could enjoy some special B&B moments as Bill continues to recover. Will Steffy begin to consider a future with Bill? There would actually be some perks if she chose him. Unlike Liam, Bill wouldn’t judge Steffy for her flaws. She’s practically a saint compared to him, so that might be nice. Steffy could be herself and not have to worry about criticism. Plus, she wouldn’t have to fight for Bill. He’d accept Steffy with open arms, so that’s another advantage. Of course, Bill doesn’t have a great track record when it comes to sticking with one woman. There’s no guarantee Bill could be faithful to Steffy forever, but at least she drives him wild right now. Liam may never look at Steffy the same way again, so she might be willing to give Bill a shot. Will all the shooting drama pull Steffy closer to Bill? Will she decide to hand Liam over to Hope and pursue a new future? We’ll give you updates as other Bold and the Beautiful news comes in. Stick with B&B and don’t forget to check CDL often for the latest Bold and the Beautiful spoilers, updates and news.